By now, if you are a phone geek, you'll know that Qualcomm rules the mobile chip business. The good and quality smartphones i have seen this year 2016 comes with mostly Snapdragon. There have been complaints that the 810 chip had over heating problem when charging and when being used. The company heard the complaints and fixed the bugs with the 820 chip. The smartphones that have the 820 chip are Samsung Galaxy S7 and Galaxy S7 Edge, Xiaomi Mi5, LG G5, HTC 10, and more others i can't mention. Recently Qualcomm Technologies has unveiled a new chip which is the Snapdragon 821. According to Qualcomm, this is not a full blown upgrade to the 820 chip. It would rather offer a few improvements here and there, like faster speeds, improved power saving, and greater application performance. 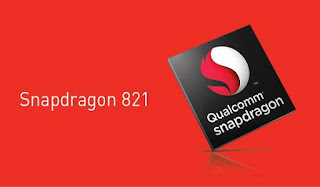 The Snapdragon 821 is engineered to deliver a 10% performance increase over the 820 with the Qualcomm Kryo quad-core CPU, reaching speeds up to 2.4GHz. This latest chip is said to reach maximum of 2.4 GHz, not like the recent version that reaches maximum at 2.15 GHz. According to source, this new chip will be coming with a new smartphone before the end of this year 2016.